Numeralla: Why Live in Numeralla? The houses in Numeralla are either farm-style cottages or solid brick and tile constructions. 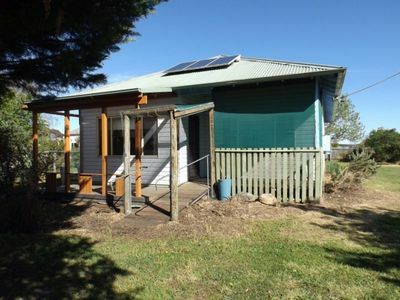 Some have corrugated iron as a roof, and are weatherboard or timber in material. They are situated on large blocks, surrounded by farmland and distant hills. Some homes have stain glass windows and timber floors, ensuring the design complements the natural Australian bushland around them. Most houses are low maintenance, leaving time to landscape gardens and care for a few cattle or sheep. The area is quiet and rural, and can get cold in the winter. The homes have slow combustion, wood fires for the colder months, and enjoy plenty of sunlight in the warmer ones. Numeralla has a general store, but is only half an hour away from Cooma. Cooma’s CBD has many retail shops, grocery stores and craft stores. The Numeralla Folk Festival is held annually on a weekend around Australia Day. There are workshops, dances and concerts, with profits from the festival going to nine local community groups. Hundreds of people attend the festival every year. There are a number of local services including builders, earth movers, electricians, plumbers, fencers, cleaners and weed control experts. In addition, there are numerous arms and small holdings specialising in everything from stud animals to the production of hazel nuts. In all the mix makes for a wide range of products. Numeralla has a public school for primary aged children. High school students travel to Cooma to attend the Monaro High School or Snowy Mountains Christian School. TAFE NSW Illawarra Institute Cooma Campus provides further education. Numeralla hosts the Australasian Orienteering Championships, bush fire brigade musters, The Numeralla Finger Plunkers who gather together to learn and play bluegrass music, The Numeralla Craft group, a t’ai chi group and a soccer and tennis club. The closest cafes and restaurants are in Comma, only 30 minutes away. Numeralla is only 20 minutes from Cooma, just under 2 hours from Canberra, just under 5 hours from Sydney and 8 hours from Melbourne. There is limited public transport, however Cooma has CountryLink buses that make daily journeys to both Canberra and the Bega Valley, and there is the Cooma – Snowy Mountains Airport which is 15 kilometres from Cooma. The small village is situated on the banks of the Numeralla River, a popular spot with anglers and once a site for gold mining. Evidence of these times can be seen on the Badja River approximately three kilometres from town toward Countegeny. Follow the signs to nearby Wadbillaga National Park and the popular Cascades camping and picnic area, where there is an easy return walk to Tuross Falls. The falls are the park’s most attractive feature, with their drop of 35m, and the 5km-long Tuross River Gorge. From the camping area at Cascades you can take a 3km walk to a lookout platform to view these beautiful natural landmarks. The park\’s two other lookouts are less accessible. The Wadbilliga Trig is reached by a walking track at the end of the fire trail which branches off the west end of Wadbilliga Road. There\’s also a lookout at the end of a short walking track off the Wadbilliga Road, just west of Wadbilliga Crossing. It is thought that the word “Numeralla” means “valley of plenty” or “where the waters meet”. The village stands at the junction of the Badja and Numeralla Rivers. The Badja got its name when the early explorers saw platypus in the river and thought they were badgers. The area now known as Numeralla was originally part of early station holdings. Settlement commenced there by 1833, and a Post Office (no longer operating) was established in 1863. Most people ran a few sheep and cows, and grew vegetables and wheat. The rich river flats were found to be suitable to grow potatoes and for a number of years Numeralla potatoes were supplied to the Monaro and Canberra markets. The local economy was also positively affected by the mining activities at Cowra Creek, Fiery Creek and Macanally which bought a certain amount of prosperity to the families of the district. The earliest homes were of bark and slabs, later replaced by stone, pise or adobe structures. Fruit trees, elms and pine trees indicate where the early selectors lived. Numeralla was proclaimed a village in 1885.The school at Numeralla was opened by the Education Department in 1877, and gained status as a Public School in 1881. Before the bridge over the Numeralla River was constructed (in September 1913), the water was crossed by punt. During the Depression, some relief work was available for local men in the form of road-work and bridge building. The Badja bridge was built during this time. Numeralla did not receive electricity until 1958. Not only has Numeralla’s local economy relied on grazing, but on other pursuits. Different crops havd been grown in the valley: wheat, oats, barley and lucerne. Saw mills were established in the 1850s. Trout was introduced into the river in 1875, and keen anglers are still drawn to the area. Eucalyptus oil was distilled in the area between 1900 and 1940. Gold mining had a significant impact on the area from the time of the early reports of gold at Big Badja goldfields in 1858, to as recent as the 1980s.The Numeralla Diggers Hall was built in 1920 to honour the local who fought in the war, and it has been the social centre of Numeralla ever since.Today the population of Numeralla village is about 50, with about 350 residing in the surrounding district of Numeralla, Peak View, Jerangle and Countegany. So if you are looking for Numeralla Real Estate, why not talk to one of our sales team at Fisk and Nagle.